There are hundreds more parks in Australia, scattered on this continent than can be shown, due to the scale of the map. Refer to the State or Regional Maps for more. World Heritage Sites. 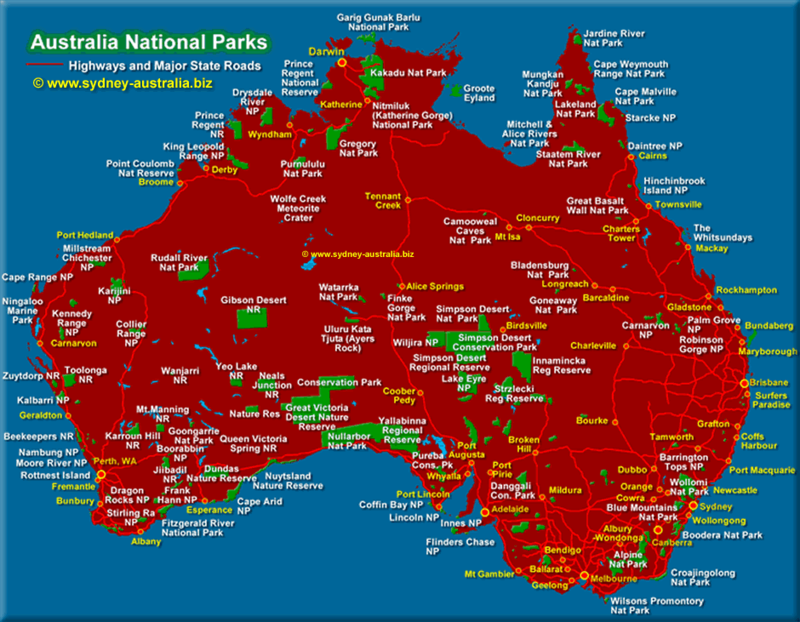 Tourist Map of Australia - showing National Parks and Reserves, See more about Australia. The map shows the larger of the National Parks and Reserves found in the Australian Capital Territory, the states of Queensland, New South Wales, Victoria, South Australia, Western Australia and The Northern Territory. Highways are marked in red, while National Parks and National Reserves are shown in green with the major lakes (some dry) shown in blue. You can see the National Parks in Tasmania on the Map of Tasmania National Parks. The Desert areas shown include the Gibson, the Simpson Desert, the Great Sandy Desert and the Nullabor Plains. If planning to drive through the remote areas, obtain quality local advice before proceeding. More about National Parks in NSW. Hotels and other accommodation in Australia includes hotels, motels, luxury resorts, caravan parks, camping, bed and breakfasts, backpackers and youth hostels. Find accommodation including hotels and resorts in Australia, see Australia Hotels.